Preliminary murder and kidnapping charges have been filed against police in India's Andhra Pradesh state after the killing of at least 20 suspected red sandalwood smugglers last week. A case has been lodged against members of the Anti-Smuggling Task Force. 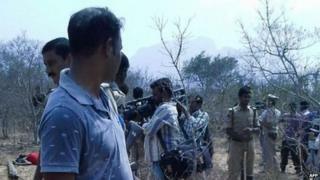 Police say the shooting happened when they were attacked by loggers near the holy town of Tirupati. But they are accused of using excessive force against the suspects, who were from neighbouring Tamil Nadu state. It is not clear how many police officers are being charged with carrying out the attack. The city of Pondicherry in Tamil Nadu was shut down by protests over the killings on Wednesday. Two witnesses to the killings have told India's National Human Rights Commission that the men were pulled off a bus and shot while in custody. Police however insist that they were forced to open fire after they were attacked by men "with axes and other sharp-edged weapons", who were cutting down trees in the remote forests near Tirupati on 7 April. The Andhra Pradesh government informed the state's high court on Wednesday that a First Information Report (FIR) has been filed against the police task force. Initial charges drawn up against suspects are usually done through the issue of FIRs in India. Sandalwood smuggling is rampant throughout the south of the country, with a ton selling for tens of thousands of dollars on the international black market. Red sandalwood, or red sanders, is a species of tree endemic to the Western Ghats of India. Correspondents say the loggers are often tribes people or other poor migrant workers from Tamil Nadu.